I'm at PierreSt's house in Munich for a minisprint trying to fix the undo system in Calligra Words. I arrived Sunday evening, and we started immediately discussing how we would solve the issues we are facing. Luckily we seem to have the same idea and understanding of the issues. The Calligra Suite recently released the 7th beta, and mostly because Calligra Words is still not ready. Building a new application from scratch takes time. Until around October the focus was on writing a new text layout system that could provide the rich text support that any user demands these days. We were not able to reuse the code from KOffice as it was simply not up to the job. So this took a lot of effort. Pretty often I hear people say that Calligra Words is a fork of KWord. As a maintainer I tell you this not true. Sure we have ripped about 20% of the code from KWord but even that has been dismantled and reassemble in a new way. That doesn't constitute a fork. Calligra Words is effectively a new word processor. We have more in common with Stage than we do with KWord. We even started the development of Words by disabling what was KWord, and then we built Words by slowly adding functionality . I often get asked about junior jobs in Calligra Words. I ususally say no, but now I actually have some. The reason I say no is that there are no easy jobs left, and so jobs would take much more of my time than I would like. And I also don't want to purposely leave unfinished stuff behind. Anyway here is a brief synopsis of the junior job: We have code that applies bold, italic etc, and it works, except it doesn't respect table cell protection. The job consists of repeating an example I've already made to the application of bold, italic and several other similar things. He has started some work on Calligra Words that I'm really interested in and I havn't seen him since middle of december. I've just committed a fix to the Calligra Engine, so that font rendering will be without hinting when compiled against Qt 4.8. And here are the obligatory screenshots to prove it (thanks buscher). Both are with system wide hinting turned on. Big thanks to Eskil Abrahamsen Blomfeldt at Nokia for implementing it in Qt. 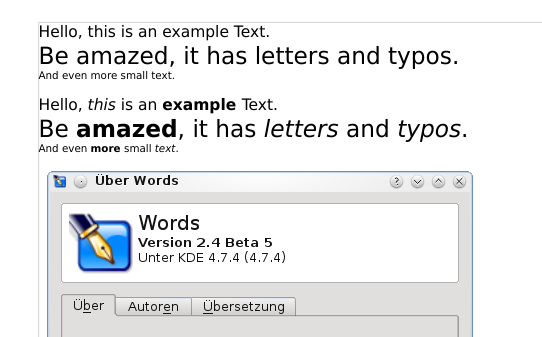 Allow me to introduce the amazing new word processor that will be released with Calligra Suite 2.4 in 2012. It is fast and nible to use, and using the powerful Calligra Engine we have made sure it can load .doc and .docx and ODF documents. And with so astonishing quality, that it will be your favourite for viewing such documents. For writing and editing we are developing an efficient and innovative user interface. It has a lightweight menu bar with only the basic File, Edit, View, Settings and Help menus. Everything else is manipulated through the sidebar. First you need a lot of dedication and time. I've spent like 15 hours a day every day since February, and since April Sebastian Sauer have spent full days on it as well. It also takes a lot of spare time plus someone to pay for my living, and this is where Nokia comes in hiring my employer KO GmbH to let me do this. I should also thank Pierre, Pierre, Gopala, Stuart, Lukas, Elvis, Matus, Matus, Thorsten, Boudewijn and Pavol for their contributuions to Words in this period.